* ASTRAL POLY TECHNIK: The board has approved acquiring entire stake in Rex Polyextrusion for 1.47 bln rupees. * AUROBINDO PHARMA: Is in final negotiations to acquire Mallinckrodt's specialty generics business in the US, including its portfolio of opioid-based painkillersfor $850 mln-$900 mln after talks resumed in May. * AXIS BANK: A consortium of lenders led by the bank has put on sale a 76 MW hydropower project--operated by Lanco Mandakini Hydro Energy--in Rudraprayag, Uttarakhand. * BANK OF INDIA: Has a credit outstanding of 6.01 bln rupees against Vadodara-based DIAMOND POWER INFRASTRUCTURE. Of this amount, a provision of 3.17 bln rupees has already been made. * BOROSIL GLASS WORKS: Made an additional investment of 149.3 mln rupees in subsidiary Klass Pack by subscribing to the rights issue, thereby increasing its stake to 70.21% from 60.30%. * CAPITAL FIRST: Will raise up to 1 bln rupees through non-convertible debentures maturing in three years, at a coupon of 9%. * GAYATRI PROJECTS: Emerged as the lowest bidder for two road projects aggregating to 27.59 bln rupees in Uttar Pradesh. * GUJARAT STATE FERTILIZERS & CHEMICALS: The Department of Fertilizers has agreed to release 6.93-bln-rupee subsidy on ammonium sulphate to the company that was withheld for the period between Mar 18, 2013 and Mar 5, 2017. * HCL TECHNOLOGIES: Board will meet on Thursday to consider buyback of shares. Andhra Pradesh, with a proposed investment of 4.08 bln rupees. * IDEA CELLULAR: Department of Telecommunications has approved the merger of Vodafone India with the company, with certain conditions. * IDFC BANK: Promoter IDFC Financial Holding has acquired 68.2 mln shares or 2% stake in the company through the open market between Jun 11 and Jul 6. * INDIAN HOTELS CO: The company, ITC have bid for Taj Mansingh hotel. * IVRCL: National Company Law Tribunal has initiated liquidation process of subsidiary Hindustan Dorr Oliver. * JBF INDUSTRIES: IFCI has sold 460,250 shares or 0.6% stake in the company at 39.86 rupees through a bulk deal on the National Stock Exchange. * JSW STEEL: Is seeking shareholder approval to raise close to 180 bln rupees from the market by issuing a bouquet of securities, including a qualified institutional placement, the company said in its annual report. * KARNATAKA BANK: Introduced cash withdrawal facility at over 13,100 point-of-sale terminals installed at various merchant establishments. * LUPIN: Received the US Food and Drug Administration's final approval to market the generic version of Concordia Pharmaceuticals Inc's Plaquenil tablets in 200-mg strength. * MAHINDRA HOLIDAYS & RESORTS INDIA: Remains positive on growth prospects and expects to increas presence by tapping newer markets, the company said in its annual report for 2017-18 (Apr-Mar). * MANAPPURAM FINANCE: Quinag Acquisition has bought 26 mln shares or 3.1% stake in the company at 105 rupees apiece in a bulk deal on the National Stock Exchange. * MM FORGINGS: Will invest 6.5 bln rupees in expanding its capacity over the next two years in view of the favourable growth outlook in its existing and new business segments. * PNC INFRATECH: Declared the lowest bidder for two road projects on the Purvanchal Expressway in Uttar Pradesh, for an aggregate value of 25.20 bln rupees. * PPAP AUTOMOTIVE: Commenced commercial production at its new plant in Gujarat. 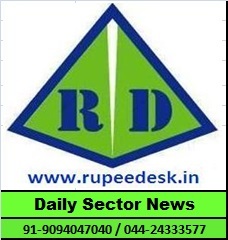 * RAJSHREE SUGARS & CHEMICALS: Is in discussion with lenders to restructure its debt in a resolution plan as it is not in a position to make the payment of interest and principal for Mar-Jun due to low availability of sugarcane and a mismatch between sugar price realisation and cane price. * RELIANCE INDUSTRIES: Has identified last-mile delivery as the biggest challenge for its planned online marketplace venture and will focus on nurturing this aspect of the business. * SADBHAV INFRASTRUCTURE PROJECT: For Apr-Jun, toll revenue from 10 operational special purpose vehicles increased 13.9% on year to 2.75 bln rupees. * SHANKARA BUILDING PRODUCTS: Appointed an investment bank to raise up to 3 bln rupees through a qualified institutional placement. * SHRIRAM TRANSPORT FINANCE CO: Said its board wasn't considering any proposal for a merger, amid persistent rumours that a merger of non-bank lenders within the Shriram Group was on the anvil. * SRF: Board has approved setting up of a biaxially-oriented polyethylene terephthalate film line and resin plant in Thailand, through wholly-owned subsidiary SRF Industries (Thailand), for 4.10 bln rupees. * STATE BANK OF INDIA: Will issue its maiden green bonds worth $500 mln-$750 mln and has appointed seven investment bankers. Has instructed its various zones to recover the 'compensation' given to officers of its erstwhile associate banks for overtime work during the demonetisation days in late 2016. * STEEL AUTHORITY OF INDIA: The company's reluctance to join a non-exit 30-year contract has delayed its joint venture with ArcelorMittal for specialised steel. * TATA MOTORS: Is offering discount of 20,000-30,000 rupees on select models purchased in July. Will invest $1 bln-- its biggest ever investment in the passenger vehicle business--in the next three years as above average growth spurs demand for newer cars. * TATA GLOBAL BEVERAGES: Subsidiary Amalgamated Plantations is poised to foray into the market of the company in the packaged tea business. * TATA STEEL: Lenders to Bhushan Power & Steel have chosen the bid of the company and tossed out the pleas of Bhushan Power's promoter familythe Singalsand that of Liberty House. * UTTAM GALVA STEELS: ArcelorMittal was neither in management control of the company, nor did it ever exercise its right to appoint a director on the board of the company, ArcelorMittal's lawyer informed the National Company Law Appellate Tribunal. * VA TECH WABAG: Board has approved raising up to 3 bln rupees through non-convertible debentures on private placement, in one or more tranches, and will seek shareholders' approval on Aug 10. * V-MART RETAIL: After consolidating its presence in the eastern parts of the country, the company plans to launch operations in the northeastern states in 2018-19.